It has been a long time since I’ve posted something & I feel compelled to do so, to communicate something of hope & acceptance in light of the passing of Amendment One. It’s not easy to be hopeful when fear & intolerance shape people’s decision making. It’s not easy to assure those in the LGBT community who are struggling with self-acceptance & are now faced with an outcome that says you are not equal. But I am reminded that no fight for civil rights has ever been fought without backlash & steps forward & steps back. I know this is a sad step back, but is not surprising in a movement that has made many steps forward. I am old enough to have been an observer & participant of these steps. I know we will continue to help people who are fearful, uncomfortable, intolerant, & blaming to find a way to a more accepting position. I believe that their is & should be room on this planet for people of diverse & conflicting views & values. I think everyone is allowed their feelings about individuals & groups of people, whether on the right or the left. As difficult as it is, I try to accept & leave room for beliefs that are not in concert with my own. But when those beliefs are used to control others & cause harm & it allows some people to wield power over others, it becomes more like injustice, inequality & tyranny. I don’t think we have the right to tell or dictate to others how to live, so long as how others live does not stand in the way of how we live. We do not have the right to refuse equality to people because we don’t like them or how they live their lives, when how they live their lives does not interfere with how we live ours. This means if you think that homosexuality is a sin, I think you have the right to those beliefs & feelings, regardless of how much I may see it differently. However, I do not think you have the right to tell me I should feel or live the same way as you do. This also means that I do not tell people who may be homophobic that they have to think & feel as I do, let alone that they have to live or love as I do. Yes, I think homophobia, as with other bigotry, on it’s face does harm, especially to family members. I see the pain these struggles cause to people I see in my office. It is more than just harmful when those we love tell us we are not okay as we are. We humans need to belong & feel connected. It is a biological imperative & rejection triggers primal feelings of abandonment & fear. But I confront the dissonance that causes homophobia with compassion & understanding. It is difficult when someone we love, especially a child, is not who we thought they were or wanted them to be. It is doubly difficult when who they are challenges some of our deepest held beliefs & values. These struggles are real, valid & deserve care. They are painful & hurtful to all involved & sadly increases the struggles of their LGBT family member. It is my hope that in this painful struggle of loved ones of LGBT people, they do not wish or actively seek that their family member have less rights & be treated badly. It is my hope that the “momma [or papa] lion” steps in & says that they will not let anyone hurt their child or grandchild, etc. I draw a distinction between this & the lives of those who may be in the neighborhood, community, state, planet, etc. For example, whether my neighbor lives as I do or I like them or not, I don’t want to take their rights away from them or deprive them of the rights that I have access to, no matter how angry I get at them or how abhorrent I think their behavior is. There are quite a few ways I can think of in which someone’s behavior offends me & I wish it would stop. But I don’t feel entitled to dictate my values on to them (no matter how much I may want to). This is because, I believe, it is not my place to say they are better than me or lesser than me. And quite frankly, it is likely, that they are equal to me, as all people are. But, let me get back to what prompted this article: Amendment One. 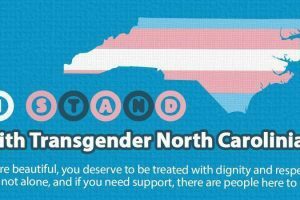 I was listening to a national talk show (okay, I confess it was the View) & they talked about the passing of this amendment in NC. The consensus was that we in NC are “so far behind…”. Progress is scary to many & some see it as allowing more room for immorality. I fundamentally disagree that some people’s definition of immorality shape politics & policy & how people are able to safely live their lives & prosper. We are a country that values the separation of church & state. We are also a country founded on all men (inclusive of women) being created equal. Our country has struggled & continues to struggle with these patriotic values. I look forward to the continued struggle, as we allow room for equality & each person to believe the religious views they hold dear without it being used to dictate people’s behavior & rights. Though this is a time to grieve this outcome, I remain hopeful that our country’s values will prevail, as history of other civil rights shows us. I also want to share my awe & appreciation to those who worked so tirelessly to ensure our rights. I hope you are proud of your accomplishments & remain encouraged by all the progress you have made. It matters! Michelle Topal, LCSW is an LGBT Therapist in Raleigh & Durham NC, specializing in the needs of the LGBT community, couples therapy & marriage counseling, child therapy, family counseling and parenting support for over 30 years. Call now to see how I can help! I Think My Child Might be Gay, Lesbian or Bisexual; What Do I Do?